Mirror, mirror, on the wall.. Step on the orange tile shown below. Enter the teleport shown below. You will be given 2 minutes to collect the the following items; 3 relaxation stones, 2 falling rocks, and 1 gold bar. 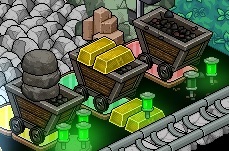 To collect them, simple step on the items and they'll be transported to the basket beside the mine carts. 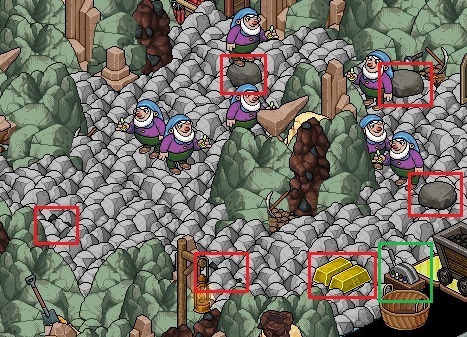 To send the items into the mine carts from the basket, step on the respective tiles shown below. Take note that you can only send these items one at a time. 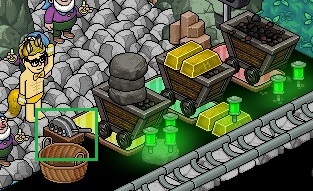 Upon collecting all the items, flick the switch highlighted in green to receive your badge! I'm so thorny right now! Go on, have a bite! HabboBites is not affiliated with, endorsed, sponsored, or specifically approved by Sulake Corporation Oy or its Affiliates. HabboBites may use the trademarks and other intellectual property of Habbo, which is permitted under Habbo Fan Site Policy. Get more as a member, sign up free! HabboBites members will get an additional prize, in the form of a prize code alongside the in-game prize (if any)! Redeem your Bites points in the Bites Shop for cool site addons and Habbo credits! Want to become a DJ?